1. First the sweater. I am foremost a sweater knitter and don't even think that I am knitting anything if there is not a sweater on the needles somewhere. "Marina is a simple, cropped jacket with a luxuriously generous collar. The design is knitted seamless up to the shoulder where two small seams connect the top of the sleeves and back to the body using ENGLISH TAILORING." I could not resist the word ENGLISH TAILORING. It sounds so professional. Marina from Rowan Felted Tweed with more details later if this love continues. 2. I have really almost stopped buying clothes for me. I keep entertaining me with the idea of making my own some way or another (that is why I needed to love my sewing machine again) so for that reason only there really should be something sensible on the needles at all times. Simple, usable and beautiful, and preferably of cotton. This is the beginning of yet another Picovoli, design by Grumperina. I think I have knit this pattern with sometimes more sometimes less adjustments and have always been successful - All my daughters have their own and I have three already, one of them is out of wool for winter, so this hopefully will be the number four for me. I just love this color of SandnesGarn Mandarin Classic; the color sure helps the battle with cotton. 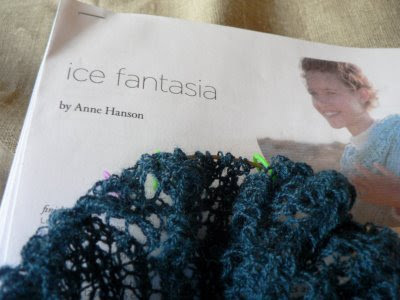 3.Lace as Ice Fantasia by Knitspot Anne Hanson. This is such a nice change to Irtfa'a; this has rest rows since the private side is mostly just purling. Humble beginnings so far, too early to talk too much. Yarn Wetterhoff Veera, all wool. Top downs, Marilinda by Cookie A, my usual construction with DPN's. Following a sock pattern was a bigger challenge than I anticipated and I have so far knit the cuff two times. For the first time around I kept looking at the pattern wondering about the outcome and comparing it to the picture of the sock. Something there was not right and sure enough, I was not following the pattern but was making my very own. Yarn is some good basic sock yarn, the ballband is missing. My knitting hero Wendy knits most if not all of her socks toe up and if she does that all the time, there has got to be a reason for it and a good one too. I had to give this toe up business just one more go, one final chance, I put my mind at rest and have sat here by Wendy's footstool learning from the master. 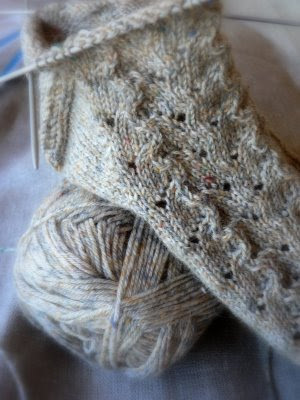 This is more than just a beginning of Rivulets Sock, a free pattern by the master herself. I just love this yarn, sadly the ballband is missing too, but these little yellow specs just talk to me. All these five make me very optimistic and so far I have a firm belief that all these will get done, sooner than later. But for that I should talk less, knit more. What a wonderful group of projects! 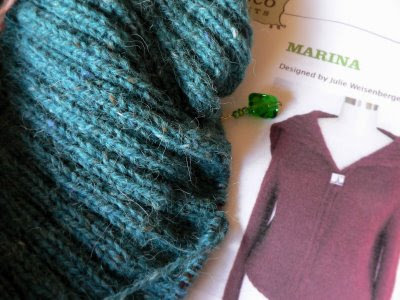 I think that everyone should have at least a couple of projects going as there is different kinds of time available for knitting. 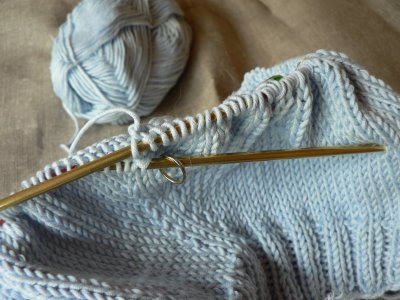 All of your current projects remind me of the beach- shades of blue and a pebbly sand color. Perfect for summer. Lene, I applaud your selections. I love all of them. I look forward to seeing the finished objects! they all five really look lovely..
ai, oot suomalainen:) vasta nyt tajusin katsoa profiilia. Mutta kirjoitat englanniksi? 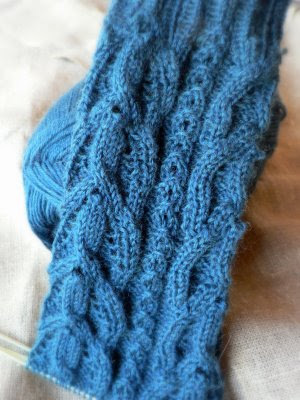 I love the yarn with which you are knitting the Rivulets socks . If you ever figure out what it is, I'd sure like to know! PS you KNOW I have to ask - how long do you have day light at this time? Beautiful, elegant garments. I take comfort in your multiple projects as it is my constant habit!